Susanne KIEFFER was born on 25 March 1754 in Mamer to Nicolaus KEIFFER (1734-1796) and Susanna SCHILTZ (1737-1807). Earlier variations of the KEIFFER surname were KIEFER and KÜFFER. Susanne was the oldest of eight known children. The only reference available online is an alphabetical family group register of births/baptisms and marriages for the town of Mamer. Actual parish records for baptisms, marriages, and burials in Mamer are only available on FamilySearch for the years 1779-1793. Küffer-Schiltz family group from the Mamer parish book. 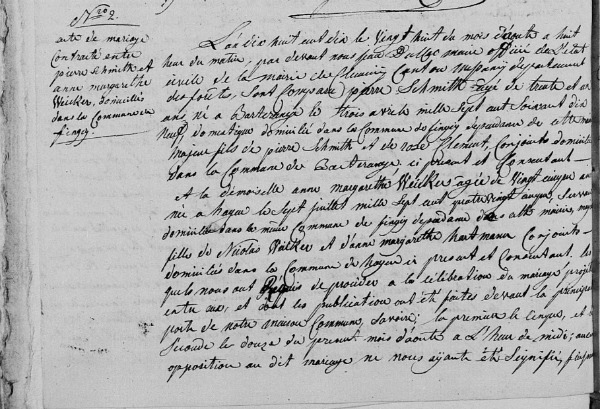 “Luxembourg registres paroissiaux, 1601-1948,” images, FamilySearch (https://familysearch.org/pal:/MM9.3.1/TH-1942-32402-77-6?cc=2037955 : accessed 28 November 2015), Mamer > Baptêmes 1718-1940, familles alphabétique > image 135 of 375; paroisses, Luxembourg (parishes, Luxembourg). Susanne was my fourth great-grandmother. She married Michel KOLBACH on 17 February 1783. Michel was born about 1748 in Kehlen to Francisci KOLBACH and Maria KAYSER. His parents were deceased at the time of his marriage. Michel and his parents were not my ancestors. Luxembourg, registres paroissiaux, 1601-1948 (images), FamilySearch (original records at Luxembourg National Archives, Plateau du Saint-Esprit, Luxembourg), Mamer > Baptêmes, mariages, sépultures 1779-1793 > image 46 of 168. 1783 Marriage Record (top of left page). (https://familysearch.org/pal:/MM9.3.1/TH-1961-32401-17711-69?cc=2037955 : accessed 29 November 2015). Susanne and Michel were the parents of five children. These children are documented as they were born during the period in which actual parish records are available on FamilySearch for baptisms, marriages, and burials during the years 1779-1793. Following the birth of Susanne and Michel’s fourth child, her sister Elisabeth married Nicolas CHRISTOPHORY (1743-1803) on 11 May 1789. Elisabeth was the only known sibling of Susanne to also marry. When their youngest child had just turned two years old, Susanne was widowed when Michel KOLBACH died on 30 May 1793. He had been a linen weaver or linitextor and was about 45 years old. 1793 Death Entry for Michel KOLBACH. 1. Luxembourg, registres paroissiaux, 1601-1948 (images), FamilySearch (original records at Luxembourg National Archives, Plateau du Saint-Esprit, Luxembourg), Mamer > Baptêmes, mariages, sépultures 1779-1793 > image 167 of 168. 1793 Death and Burial Record. (https://familysearch.org/pal:/MM9.3.1/TH-1942-32402-335-60?cc=2037955 : accessed 29 November 2015). A little over seven months later Susanne remarried. On 7 January 1794, she married Paulus FRANTZ. Paulus was the son of Nicolaus FRANTZ and Angela BARTEL of Senningen. 1794 Marriage Index Card. 2. Luxembourg, registres paroissiaux, 1601-1948 (images), FamilySearch (original records at Luxembourg National Archives, Plateau du Saint-Esprit, Luxembourg), Mamer > Tables des mariages 1779-1804 (index organisée par l’époux) > image 41 of 238. 1794 Marriage Index Card. (https://familysearch.org/ark:/61903/3:1:3QS7-L9WS-431Q?cc=2037955&wc=STHD-2NY%3A1500941501%2C1501133556 : accessed 20 December 2017). No marriage record has been found for Susanne and Paulus. Their marriage is recorded on a marriage index card. The information on the card points to Paulus being from Bergem in the parish of Schifflingen. Per the 1843 census, Paulus was born on 10 August 1763 in Senningen. On the 1846 census, the day and month were the same but the year was 1764. The place of birth on the 1846 census was blank. Although their names are known, his parents and siblings are at this time a brick wall. Paulus was my fourth great-grandfather. When he married Susanne he took on a family of five children between the ages of 3 and 10 years. Like Susanne’s first husband Michel, Paulus was a linen weaver. Susanne was soon expecting twins. Nicolas and Johannes were born on 21 November 1794. As no birth records are available for the twins it is not known who was the oldest. Nicolas or my third great-grandfather Johannes. When the twins were seventeen months old their grandfather, Susanne’s father, Nicolaus KEIFFER died on 1 May 1796. Susanne gave birth to another son on 10 January 1797. He was named Henri. Less than two months later Susanne’s youngest daughter from her first marriage, Anna Maria, died at the age of five years on 6 March 1797. The family may have been battling some kind of disease or the baby was not strong enough to survive as little Henri died on 6 June 1797 at the age of five months. The children grew and by 1802 the Susanne’s oldest daughter was courting and the results were soon to be seen. Margaretha was 17 years old when she married Leonardus RÖELINGER on 18 November 1802. Three and a half months later, on 9 March 1803, she gave birth to a boy she named after her father Michel. Susanne’s brother-in-law Nicolas CHRISTOPHORY died on 16 December 1803. His widow Elisabeth was 46 years old when she married Theodore HELLESCH on 7 May 1806. 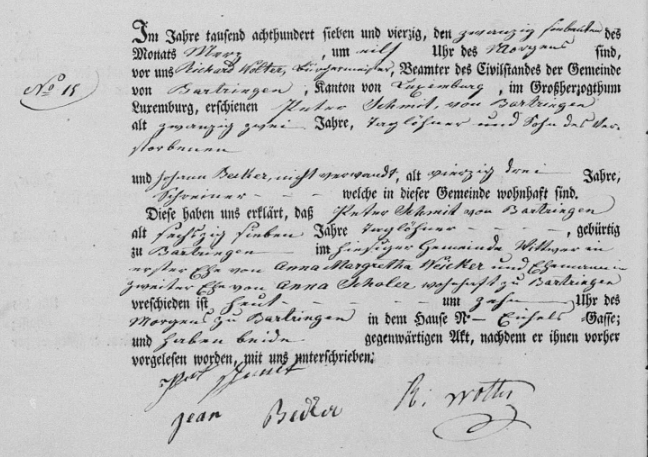 It was on this marriage record that the 1796 date of death for Nicolaus KIEFFER, the bride’s father, was found. Susanne’s mother Susanna SCHILTZ died on 4 August 1807. Her son-in-law Paulus FRANTZ was the informant on her death record. A little over a year later, on 9 October 1808, he was once again at the city hall reporting a death. This time it was his wife Susanne KIEFFER who died at the age of 54 years. She left 4 KOLBACH children and the FRANTZ twins. My 4th great-grandfather was now alone to care for his 13-year-old twin boys and three unmarried step-children who were in their twenties. Only his step-daughter Marguerite was married with two little boys but likely also living in the household as was her right as the oldest. 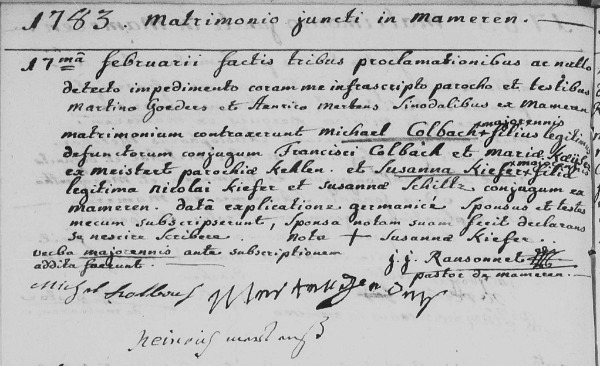 Five years after the death of Susanne her daughter Catherine KOLBACH married Jacques HENTGES in Mondercange on 29 December 1813. This marriage was only found in the last few days. 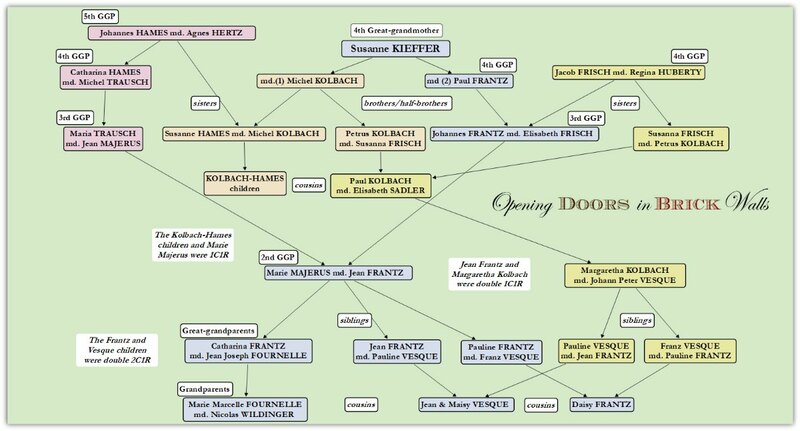 Her brothers Michel and Peter KOLBACH would add some very interesting branches to my family tree. Michel KOLBACH married Susanne HAMES (1786-1855) on 11 January 1815 in Mamer. Susanne was the sister of my 4th great-grandmother Catherine HAMES (1789-1864), my direct matrilineal line. Petrus KOLBACH married Susanna FRISCH on 14 January 1818 in Mamer. Susanna FRISCH, daughter of Jacob FRISCH and Regina HUBERTY. Jacob and Regina are also my fourth great-grandparents. Confused? I hope this will help. Less than three weeks later Nicolas FRANTZ, one of the twins, married Anna KÜNSCH (1795-1875) on 3 February 1818 in Mamer. It would be another nine years before the other twin, my fourth great-grandfather, would marry Elisabeta FRISCH (1800-1880), daughter of the above mentioned Jacob FRISCH and Regina HUBERTY. They were married on 18 January 1827 in Holzem. 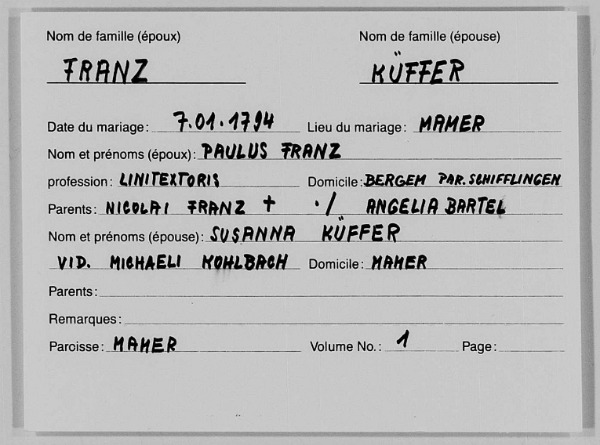 All of Paulus FRANTZ’s children, biological and step, were now married. I believe Paulus was living in the home he had shared with his wife Susanne with her oldest daughter Margaretha and her family. This is supported by the census taken in 1843 and 1846. But before the census was enumerated there were several deaths in the family. Petrus KOLBACH, a father of three sons, died on 23 April 1837 in Mamer at the age of 48. His widow Susan FRISCH would live to the age of 93 dying on 20 October 1885. The oldest of the bunch, Margaretha KOLBACH had given birth to ten children. She died on 16 December 1838 in Mamer. She left a widower and six children. During the years the family had changed the spelling of RÖELINGER to RELINGER and finally REDLINGER, the version seen when Margaretha’s widower Leonardus die on 20 March 1843. 1843 Paul Frantz household. “Luxembourg Volkszählungen 1843-1900,” images, FamilySearch (https://familysearch.org/ark:/61903/3:1:3QS7-997B-2YDZ?cc=2037957&wc=M5LT-R99%3A345860401%2C345863501 : 22 May 2014), Mamer > 1843 > image 73 of 291; Archives Nationales de Luxembourg (Luxembourg National Archives, Luxembourg). In 1843 when the census was taken, Paulus FRANTZ was the head of a household in Mamer. Living with him was his step-grandson Peter REDLINGER, his wife Susana WAGNER and their four children. Both of Peter’s parents were deceased and he was likely the oldest of the REDLINGER children. The family home may have been passed on to him. In 1846 Peter REDLINGER was the head of household and Paulus FRANTZ, as well as three of Peter’s single brothers, was living with the family. Paulus died at 8 in the morning on 27 July 1847 in Mamer at the age of 83. His death was reported by his step-grandson Peter REDLINGER. Michel KOLBACH died on 18 April 1855 in Mamer at the age of 70. He had fathered six children, two of whom died at a young age. His widow Susanna HAMES died exactly a month later on 18 May 1855 at the age of 68. The only living KOLBACH child, Catherine died on 30 October 1869 in Bergem. Until a few days ago I thought she may have died as a child. However, after finding her marriage record, I learned she was the mother of at least six children. Her husband Jacques died on the oldest son’s 15th birthday in 1830 leaving her widowed with children between the ages of 2 and 15. Susanne KIEFFER’s KOLBACH children were now all deceased. Her twins, the sons she bore Paulus FRANTZ, lived into their eighties. Nicolas FRANTZ, father of seven children (at least two died young), died on 8 August 1879 at the age of 84 and my fourth great-grandfather Johannes FRANTZ, father of five children (one died young) died on 24 January 1880 at the age of 85. One final note of interest and the reason for the peculiar title for this article. My 4th great-grandparents Paulus FRANTZ and Susanne KIEFFER were the 2nd great-grandparents of the famous Nicolas “Nic” FRANTZ, winner of the 1927 and 1928 Tour de France. He was not the first Luxembourger to win the Tour but he was the only one to win it twice and twice in a row. P.S. Things are always busy this time of the year and I have not had the time to include the sources at the end of my last few articles. I relied on being able to point my readers to my online GEDCOM file, however, Rootsweb is currently unavailable and it is not known how long the downtime will last. Three more sets of 4th great-grandparents to go and then I will come back and add the sources later in January 2018. © 2017, copyright Cathy Meder-Dempsey. All rights reserved. The rewards of blogging are awesome, astounding, astonishing, amazing… those are only the A’s and I could go on and on. I found a marriage that could match in Clemency, 28/08/1810, but I can’t access Family Search, it’s probably too busy. You could check yourself later. I didn’t wait until later and was able to pull up the record she believed was the marriage of Peter SCHMIT and Margaretha WEICKER. In 1810 on the 28th of August at 8 in the morning Pierre SCHMITT age 31 born in Bertrange the 3 April 1779, a domestic living in the commune of Fingig, the of age son of Pierre SCHMITT and Rose CLEMMENT, a married couple living in the commune of Bertrange…. and a young woman Anne Margaretha WEICKER age 25 born in Hagen the 7 September 1785, a servant living in the same commune of Fingig, the of age daughter of Nicolas WEICKER and Anne Margaretha HARTMANN, a married couple living in the commune of Hagen… all were present and consenting to the marriage for which banns had been read before the entrance of the Clemency civil office. The paperwork of the bride and groom was presented according to the legal requirements of the time. The bride and groom were declared husband and wife after affirming this was their choice. Four witnesses were present and signed along with the civil officer, the mayor of Clemency. The bride and groom declared not being able to write. The fathers of the bride and groom signed first as seen above. Five and a half months later, Peter and Margaretha became the parents of their first child Magdalena, my children’s 4th great-grandmother. The marriage record led to the 1785 baptismal record of Anna WEICKERS [sic, Margaretha was not included on this record], daughter of Nicolai WEICKERS and Anna Margaretha HARTMAN. Why didn’t I notice abt. 1795 could not have been her year of birth? She would have been only 16 when her first child was born. With the names of the parents, I was able to add three generations to the WEICKER line. I had suspected Nicolas WEICKER and Anne Margarethe HARTMANN were the bride’s parents because…. The godmother of Peter SCHMIT and Margaretha WEICKER’s first child Magdalena was Magdalena KÜNSCH from Hohen (or Hagen) in the parish of Sterpenich. Anna Margaretha HARTMANN was the widow of Peter KÜNSCH when she married Nicolas WEICKER. Was Magdalena KÜNSCH an older half-sister of Margaretha WEICKER? Further research may tell. With the names of three new couples in the family tree, I will be busy finding the records to document them and may even be able to add more ancestral names. Special thanks to my friend Linda for taking the time to read my posts, give me advice, and for telling me where to find the marriage record of Peter SCHMIT and Anne Margaretha WEICKER. *Linda has helped me out several times already. A Latin Rule You May Not Have Known was the result of one of her tips. Happy Family History Month to all. Wishing you lots of keys to open the doors in your brick walls. Luxembourg, Registres d’état civil, 1662-1941 (images), FamilySearch (original records at Luxembourg National Archives, Plateau du Saint-Esprit, Luxembourg), Clemency > Naissances, mariages, décès 1804-1805 Naissances 1805-1890 Mariages 1796-1885 > image 1034 of 1491. 1810 Marriage Record (bottom left, top right). (https://familysearch.org/ark:/61903/3:1:S3HY-XHPS-511?cc=1709358&wc=9RYD-SP8%3A129628001%2C129815201 : accessed 30 September 2017). Belgique, Luxembourg, Registres paroissiaux, (images), FamilySearch (original records at België Nationaal Archief, Brussels / Belgium National Archives, Brussels), Paroisse de Sterpenich (Luxembourg) now part of Autelbas, Luxembourg, Belgium > Baptêmes, mariages, sepultures 1779-1793 > Film/DGS 1658890 > Film # 008126375 > Item 8 > image 1106 of 1430. 1785 Baptismal Record (left page, last entry > right page, first entry). (https://www.familysearch.org/ark:/61903/3:1:3Q9M-CSVK-Y8VF-9?i=1105&cat=203740 : accessed 1 October 2017). 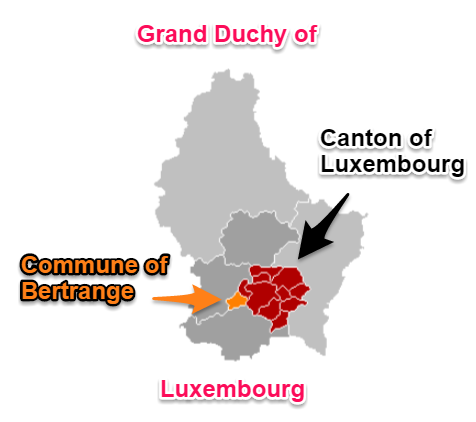 In 1756 two children were born in Bertrange, in the Grand Duchy of Luxembourg, one on September 20th and the other on October 2nd. Their baptismal records are on the same page in the parish register, the second right below the first. The twelve days between no children were born in Bertrange. A little over twenty years later, on 10 February 1777, the two children were once again seen in the parish register, this time getting married – to each other. 1777 Marriage Record No. 318 for Petrus Schmid and Rosa Clemens. Peter SCHMIT (1756-1816) and Rosa CLEMENS (1756-1815), the children who were baptized in 1756 and the couple who married in 1777, had ten children born between 1778 and 1799. Their second son Peter SCHMIT, my children’s 5th great-grandfather, was born and baptized on 3 April 1779 in Bertrange. His godparents were Petrus KREMER and Catharina SCHMIT. His father was present and signed the record in longhand. 1779 Baptismal Record of Petrus Schmit with father’s signature [pater]. Peter SCHMIT married Margaretha WEICKER before 1811. Their marriage took place before their first child was born however a marriage record has not been found. The couple was always referred to as legally married when their children were born. The marriage record was not found in Bertrange parish records from 1802-1811 or in the tables décennales (10-year lists) for the years 1802-1812 for Bertrange and Steinfort. Records were usually very well kept and I believe one day Peter and Margaretha’s marriage will turn up. 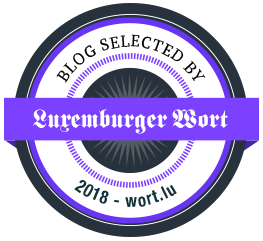 Perhaps sooner than later as my genealogy society Luxracines has dedicated members working on a marriage project – indexing all marriages in Luxembourg from 1802 to 1923. Why is Margaretha WEICKER’s Parentage Unknown? Margaretha, my children’s 5th great-grandmother, was born about 1795 in Hoën (Hagen), Sterpenich, Grand Duchy of Luxembourg. The year of birth was estimated from her age at the time of death. Records for Hagen, a village in the Steinfort area, are not in the FamilySearch collection for Luxembourg for this period. 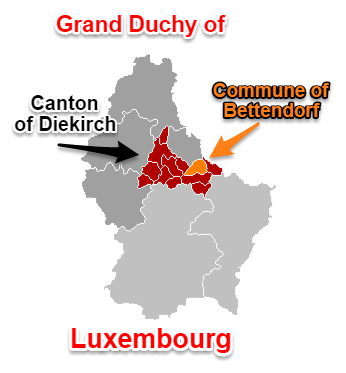 The Grand Duchy was under a double administration for about eight years before the Treaty of London was passed in 1839 when the present borders of Luxembourg were defined. Repatriation of the records (return to the country of origin) was not simple. Records for Steinfort for the period before the borders were changed can be found in Autelbas in the Province of Luxembourg in Belgium. 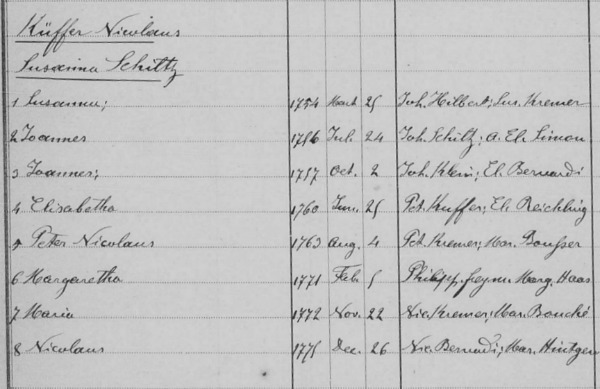 Civil records beginning in 1796 for Autelbas are online at FamilySearch. As Margaretha’s birth may have been earlier I checked the parish records for Sterpenich in the FamilySearch catalog. The parish records of Sterpenich for the years 1779-1793 are conformed copies made from the originals by the Luxembourg authorities and given to the Belgium government in December 1844 per the convention of Utrecht signed in 1843, i.e. repatriation. I have no idea where the records for the years 1794-1795 may be found and am at a standstill on my research for Margaretha, her birth, and parentage. Not only are the records missing, Margaretha’s name has been found with several variations. Her family name was spelled WEIKER or WEICKER and also seen as WIKERT. Her first name was Margaretha in early documents and Anne Marguerite in later years. These are all things which need to be considered when future research is done on her parentage. Magdalena SCHMIT was born on 10 February 1811 in domo Donnen in Bertrange. She was baptized the same day. Her godfather was Joannes SCHMIDT from Bertrange and her godmother was Magdalena KÜNSCH from Hohen (or Hagen) in the parish of Sterpenich. Was her godmother her grandmother, an aunt, or cousin? This may be a clue to solving the question of her mother’s parentage. Rosa SCHMIT was born on 7 Feb 1815 in domo Bour in Bertrange and baptized the same day. Her godmother was her paternal grandmother Rosa CLEMENS. Her godfather was Nicolaus WEICKER of Hohen. Could he have been her maternal grandfather or an uncle? Rosa’s godmother and paternal grandmother Rosa CLEMENS died only a few months later on 22 May 1815. Her paternal grandfather Peter SCHMIT died on 11 February 1816. Rosa died two weeks later on 26 February 1816 in domo Donnen in Bertrange shortly after her first birthday. She was buried the following day. Her religious death and burial record has her mother’s name as Anna Margaretha Hinnicker instead of Weicker. Nicolas SCHMIT was born at seven in the morning on 8 April 1817 in Bertrange. His father reported the birth two hours later. 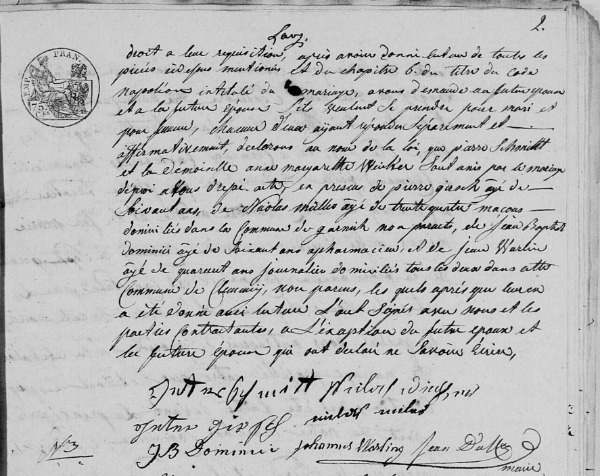 As baptismal records for Bertrange are only available online up to 1816 the godparents of Nicolas and his younger siblings were not found as they were for Magdalena and Rosa. Michel SCHMIT was born at two in the morning on 10 February 1819 in Bertrange. His father reported the birth eight hours later. Following their youngest child Michel’s first birthday, Peter and Margaretha lost their second child, son Nicolas. He died on 21 February 1820 in Bertrange at the age of nearly three years. Jean SCHMIT* was born at three in the afternoon on 12 July 1820. His father reported the birth two days later at eight in the morning on the 14th. This child’s birth record was only found after this post was ready to be published. While reading through the final draft I realized something was wrong and checked again on SCHMIT children born in Bertrange. Maria Catharina SCHMIT was born at two in the morning on 25 February 1822 in Bertrange. Her father reported the birth the same day at nine in the morning. Jean SCHMIT was born at 9:30 in the morning on 3 September 1825 in Bertrange. His father reported the birth the same day at eleven in the morning. As was the case with all of his children’s births, Peter declared not being able to write. I found this strange, his being the second born of a father who was able to write as seen above at the time of his own baptism in 1779. The mother of the five living children, Margaretha WEICKER, died on 17 January 1826 in Bartringen. She was 31 years old at the time of her death. Her youngest child was only four months old and her oldest would shortly be turning fifteen. Her name on the record was Anne Marguerithe WEICKER. The addition of Anne to her name was also seen on the birth records of her two youngest children. Following the death of his wife, Peter waited two years before taking a second wife. This seems unusual as he had been left with five children, one still a baby. Magdalena, his oldest child, likely took on the responsibilities of a little mother, helping care for her younger siblings. Peter married Anne Marie SCHOLER, daughter of Jean SCHOLER and Susanne BOURENS, on 22 March 1828 in Bertrange. Anne Marie was born on 4 June 1792 in Obersyren (Schuttrange). Peter and his second wife Anne Marie had only one child, a daughter, Madelaine born four years into the marriage on 16 July 1832 in Bertrange. Her half-siblings were by this time 7, 10, 12, 13, and 21 years old. She did not, however, grow up without a playmate. Peter’s oldest daughter Magdalena gave birth to a natural daughter on 7 November 1835. Anne’s father’s name was not on the birth record. Natural was the term used for children born out of wedlock. Anne appears to have been raised in her maternal grandfather’s household as she was listed with Peter and Anne Marie on the 1843 and 1846 census. Peter’s second wife Anne Marie had a sister Margaretha SCHOLER (1802-1842) who was married to Jacob RUCKERT (1787-1856). Margaretha gave Jacob eight children, six of whom were living when she died after giving birth to the last on 20 March 1842.. Peter’s brother-in-law Jacob became his son-in-law eight months later. Peter and Margaretha’s oldest daughter Magdalena married Jacob RUCKERT, son of Johann RUCKERT and Angelique MICHELS, on 26 November 1842 in Bartringen. Jacob was born on 23 July 1787 in domo Michels in Bertrange and baptized the same day. The marriage would last fourteen years ending with Jacob’s death on 24 June 1856 in Bertrange. Magdalena and Jacob were my children’s 4th great-grandparents. This is their story: 52 Ancestors: #41 How Jacob RUCKERT’s Brother-in-law Peter SCHMIT Became his Father-in-law. At eleven in the morning of 27 March 1847 Peter SCHMIT age 22 reported the death of his father Peter SCHMIT who had died only two hours earlier at his home in the neighborhood called Eichels in Bertrange. I have a small problem with this death record as Peter did not have a son named Peter. Both of Peter’s wives are correctly named on the death record. Is the signature of the informant that of Jean SCHMIT the youngest son who was 22 years old at the time? The younger Jean was the only child to remain in his father’s household in 1843 and 1846 and was seen with his step-mother in 1847. Due to the fact that I found another son named Jean born in 1820, I believe the younger son may have been known as Johann Peter (Jean Pierre) to distinguish him from his older brother Jean. 1847 Luxembourg Census. Household of Anne Scholer, widow of Peter Schmit, with her step-children and daughter. In the 1847 census, Peter’s widow Anne SCHOLER was the head of household with her stepsons Michel, Jean (26), Jean (22) and stepdaughter Maria Catharina (children from Peter’s first marriage) and her only child, daughter Madelaine from her marriage to Peter. This entry in the census led me to search once again for children of Peter and Margaretha but only after I had finished the research and written this post. Michel, the elder Jean, and Maria Catharina were not in their father’s household in 1843 or 1846. This was not unusual as they were of an age to be working outside of the home. I had wrongly assumed the elder Jean found in the 1847 census was an error or relative other than child. Peter’s widow Anne Marie SCHOLER and their daughter Madelaine have not found after the 1847 census. 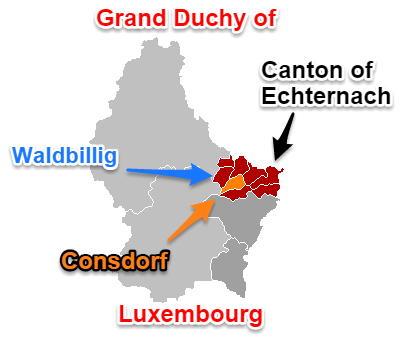 The Grand Duchy of Luxembourg is divided into three districts: Luxembourg, Diekirch, and Grevenmacher (dark gray areas in the maps below). Each district is divided into cantons (red areas in the maps below) and each canton is divided into communes. Several towns and villages may be part of a commune. Peter SCHMIT and Margaretha WEICKER’s children grew up in the town of Bertrange. Peter had deep roots in the town as his parents and grandparents all came from the town. Their oldest daughter Magdalena SCHMIT raised her family in Bertrange. She was likely the first of the siblings to pass away. * She died on 30 September 1870 in Bertrange. Other than her natural daughter Anne, she had a son and three daughters with Jacob RUCKERT. The son has not been found after he turned 21 in 1864. One daughter died as an infant. The youngest daughter had a natural son (1867-1868) and it is not known if she ever married or where she lived after her mother’s death. The older daughter Margaretha, my children’s 3rd great-grandmother, married but there is still the mystery of what happened to her and of her family after 1895. It is only through the marriage of her daughter Maria MERTES in 1894 and the census of 1895 that I know that Margaretha and her husband Michel MERTES were still living in 1895. Peter and Margaretha’s youngest son Jean SCHMIT (b. 1825) also spent his married life in Bertrange. But before this, he was living and working in other places. One residence was Mondercange where he was in May 1852 when his brother Michel married. He was one of the four witnesses and signed “Jang Schmit.” Six years later he was living and working in Noertzange (Bettembourg) when he made plans to marry. Jean married Maria RISCHARD on 20 January 1858 in Schuttrange. Maria was born on 16 March 1827 in Uebersyren (Schuttrange), the same place Jean’s step-mother was born. They lived in Bertrange their entire married life. They were the parents of 6 children, three of whom died at a young age. Of the three living children, a daughter married and had children. The two sons were working in Lothringen (France) in the late 1890s – they have not been traced. Jean SCHMIT died on 28 November 1892 in Bertrange. His death record has the right wife but the wrong parents. The information was given by his son-in-law Mathias HANSEN. Jean’s wife died six years later on 30 April 1898 in Bertrange. The second daughter of Peter and Margaretha, Maria Catharina married Joseph POECKER on 20 February 1852 in Bettendorf. Joseph was born on 25 February 1819 in Bettendorf. How Maria Catharina came to marry in Bettendorf is unknown at this time. She and her husband raised their family on Fooshof. They had seven children, four of whom died in infancy. A daughter who never married died at the age of 38 years. The youngest living son born in 1864 was unmarried at the time of the 1900 census. He was living with his brother Nicolas who had married in 1893 and continued the line. Maria Catharina died on 1 September 1879 on the family farm, Fooshof in Bettendorf. Her husband Joseph died on 19 January 1895 on Fooshof. Peter and Margaretha’s oldest son Michel married Anna Margretha BRAUN on 5 May 1852 in Waldbillig. Anna was born on 12 May 1826 in Bettange-sur-Mess (Dippach). Michel and Anna Margretha started their family when they were working on the Wolperhof in the commune of Consdorf. Three of their children were born here. 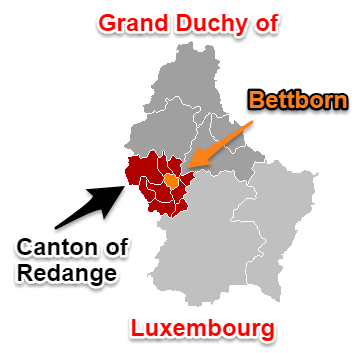 The third child’s birth at Wolper was followed by a move to the western part of Luxembourg in the commune of Bettborn. 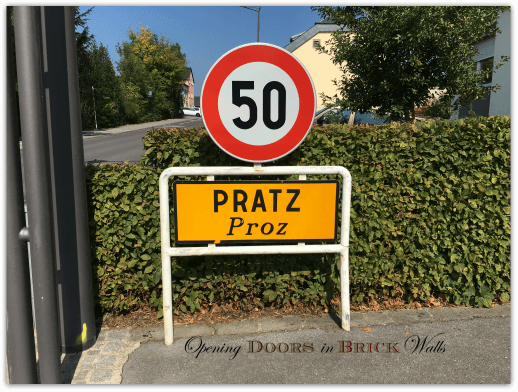 Three more children were born in Pratz, part of the commune of Bettborn. Michel and Anna Margretha lived in Horaz from 1885. 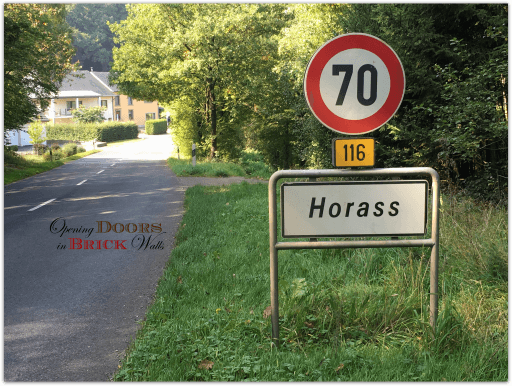 Not far from Pratz, Horaz, which is also spelled Horass, only had two households. Michel SCHMIT was the oldest son and last living child of Peter and Margaretha. He died on 26 December 1898 in Horaz. His wife Anna Margretha predeceased him on 12 November 1890 in Horaz. * Due to my only learning of the existence of the elder son Jean born in 1820 after writing this post, I have not had the time to research where he may have lived and worked, if he ever married and had children, and when and where he died. Considering his name Jean SCHMIT – just another John Smith – the search may take a while. There is an update to this post! This is the last post on my children’s paternal 5th great-grandparents. I already wrote about half of their maternal 5th great-grandparents (my paternal 4th great-grandparents) in 2014 when I did the first round of Amy Johnson Crow‘s 52 Ancestors in 52 Weeks challenge. Next up will be 16 sets of my maternal 4th great-grandparents. The first eight being from small towns and villages which are now part of Germany near the Luxembourg border. The last eight will be from Luxembourg. I hope to finish up this series by the end of the year even though there are only 13 weeks left. Wish me luck and lots of free time. Maps used are in the Public domain (Wikimedia Commons) and were annotated using Evernote. Luxembourg, registres paroissiaux, 1601-1948 (images), FamilySearch (original records at Luxembourg National Archives, Plateau du Saint-Esprit, Luxembourg), Bertrange > Baptêmes 1723-1780, confirmations 1755-1767, mariages 1723-1780, sépultures 1723-1780 > image 59 of 200. 1756 Baptismal Record No. 242. (https://familysearch.org/ark:/61903/3:1:3QSQ-G971-1CGD?cc=2037955&wc=STH6-92Q%3A1500936901%2C1501072268 : accessed 15 September 2017). Ibid., Bertrange > Baptêmes 1723-1780, confirmations 1755-1767, mariages 1723-1780, sépultures 1723-1780 > image 59 of 200. 1756 Baptismal Record No. 243. (https://familysearch.org/ark:/61903/3:1:3QSQ-G971-1CGD?cc=2037955&wc=STH6-92Q%3A1500936901%2C1501072268 : accessed 15 September 2017). Ibid., Bertrange > Baptêmes 1723-1780, confirmations 1755-1767, mariages 1723-1780, sépultures 1723-1780 > image 150 of 200. 1777 Marriage Record No. 318 (right page, 2nd entry). (https://familysearch.org/ark:/61903/3:1:3QSQ-G971-1C6Q?cc=2037955&wc=STH6-92Q%3A1500936901%2C1501072268 : accessed 15 September 2017). Luxembourg, Volkszählungen 1843-1900 (images), FamilySearch (original records at Luxembourg National Archives, Plateau du Saint-Esprit, Luxembourg), Bertrange > Baptêmes 1723-1780, confirmations 1755-1767, mariages 1723-1780, sépultures 1723-1780 > image 106 of 200. 1779 Baptismal Record No. 19. (https://familysearch.org/ark:/61903/3:1:3QS7-L971-1CTL?cc=2037955&wc=STH6-92Q%3A1500936901%2C1501072268 : accessed 13 September 2017). Luxembourg, Registres d’état civil, 1662-1941 (images), FamilySearch (original records at Luxembourg National Archives, Plateau du Saint-Esprit, Luxembourg), Bertrange > Mariages 1828-1890 Décès 1796-1890 > image 684 of 1416. 1826 Death Record No. 6. (https://familysearch.org/pal:/MM9.3.1/TH-267-12131-52047-76?cc=1709358 : accessed 2 April 2010). Ibid., Bertrange > Naissances 1796-1890 Mariages 1796-1827 > image 125 of 1480. 1811 Birth Record (left page). (https://familysearch.org/ark:/61903/3:1:S3HY-X363-TRT?cc=1709358&wc=9RY8-YWL%3A129622901%2C129854201 : accessed 10 Apr 2013). Luxembourg Church Records, Bertrange > Baptêmes, mariages, sépultures 1808-1816 > image 32 of 86. 1811 Baptismal Record. (https://familysearch.org/ark:/61903/3:1:3QSQ-G9WS-SZWW?cc=2037955&wc=STHD-3YW%3A1500936901%2C1500942502 : accessed 14 September 2017). Luxembourg Civil Records, Bertrange > Naissances 1796-1890 Mariages 1796-1827 > image 168 of 1480. 1815 Birth Record (right, top). (https://familysearch.org/ark:/61903/3:1:S3HY-X363-RLJ?cc=1709358&wc=9RY8-YWL%3A129622901%2C129854201 : accessed 14 September 2017). Luxembourg Church Records, Bertrange > Baptêmes, mariages, sépultures 1808-1816 > image 69 of 86. 1815 Baptismal Record (left). (https://familysearch.org/ark:/61903/3:1:3QS7-99WS-SCF7?cc=2037955&wc=STHD-3YW%3A1500936901%2C1500942502 : accessed 15 September 2017). Luxembourg Civil Records, Bertrange > Mariages 1828-1890 Décès 1796-1890 > image 595 of 1416. 1816 Death Record No. 5. (https://familysearch.org/ark:/61903/3:1:S3HY-6X89-1WQ?cc=1709358&wc=9RYC-829%3A129622901%2C129640401 : accessed 15 September 2017). Luxembourg Church Records, Bertrange > Baptêmes, mariages, sépultures 1808-1816 > image 84 of 86. 1816 Death Record (right page, last entry). (https://familysearch.org/ark:/61903/3:1:3QS7-99WS-SCHD?cc=2037955&wc=STHD-3YW%3A1500936901%2C1500942502 : accessed 15 September 2017). Luxembourg Civil Records, Bertrange > Naissances 1796-1890 Mariages 1796-1827 > image 191 of 1480. 1817 Birth Record No. 16. (https://familysearch.org/ark:/61903/3:1:S3HY-X36Q-SWY?cc=1709358&wc=9RY8-YWL%3A129622901%2C129854201 : accessed 14 September 2017). Ibid., Bertrange > Naissances 1796-1890 Mariages 1796-1827 > image 210 of 1480. 1819 Birth Record No. 4. (https://familysearch.org/ark:/61903/3:1:S3HY-X363-RCS?cc=1709358&wc=9RY8-YWL%3A129622901%2C129854201 : acccessed 14 September 2017). Ibid., Bertrange > Mariages 1828-1890 Décès 1796-1890 > image 637 of 1416. 1820 Death Record No. 7. (https://familysearch.org/ark:/61903/3:1:S3HY-6X8S-39Q?cc=1709358&wc=9RYC-829%3A129622901%2C129640401 : accessed 14 September 2017). Ibid., Bertrange > Naissances 1796-1890 Mariages 1796-1827 > image 242 of 1480. 1822 Birth Record No. 5. (https://familysearch.org/ark:/61903/3:1:S3HY-X36Q-SHK?cc=1709358&wc=9RY8-YWL%3A129622901%2C129854201 : accessed 14 September 2017). Ibid., Bertrange > Naissances 1796-1890 Mariages 1796-1827 > image 288 of 1480. 1825 Birth Record No. 36. (https://familysearch.org/ark:/61903/3:1:S3HY-X363-TST?cc=1709358&wc=9RY8-YWL%3A129622901%2C129854201 : accessed 14 September 2017). Ibid., Bertrange > Mariages 1828-1890 Décès 1796-1890 > image 11 of 1416. 1828 Marriage Record No. 9. (https://familysearch.org/pal:/MM9.3.1/TH-267-12131-54927-45?cc=1709358 : accessed 8 October 2015). Ibid., Bertrange > Naissances 1796-1890 Mariages 1796-1827 > image 411 of 1480. 1832 Birth Record No. 28. (https://familysearch.org/ark:/61903/3:1:S3HY-X363-RKD?cc=1709358&wc=9RY8-YWL%3A129622901%2C129854201 : acccessed 14 September 2017). Ibid., Bertrange > Naissances 1796-1890 Mariages 1796-1827 > image 479 of 1480. 1835 Birth Record No. 69. (https://familysearch.org/ark:/61903/3:1:S3HY-X36Q-987?cc=1709358&wc=9RY8-YWL%3A129622901%2C129854201 : accessed 7 October 2015). Luxembourg Census Records, Bertrange > 1843 > image 144 of 407. Schmit-Scholer household. (https://familysearch.org/ark:/61903/3:1:3QS7-897B-FJ1T?cc=2037957&wc=M5LR-NQ9%3A346116301%2C345863501 : accessed 14 September 2017). Ibid., Bertrange > 1846 > image 206 of 431. Schmit-Scholer household. (https://familysearch.org/ark:/61903/3:1:3QS7-997B-VDT6?cc=2037957&wc=M5LT-ZJF%3A346116301%2C345858602 : accessed 14 September 2017). Luxembourg Civil Records, Bertrange > Mariages 1828-1890 Décès 1796-1890 > image 907 of 1416. 1842 Death Record No. 10. (https://familysearch.org/pal:/MM9.3.1/TH-267-12131-51891-68?cc=1709358 : accessed 6 October 2015). Ibid., Bertrange > Mariages 1828-1890 Décès 1796-1890 > image 156 of 1416. 1842 Marriage Record No. 21. (https://familysearch.org/pal:/MM9.3.1/TH-267-12131-57204-95?cc=1709358&wc=M9M6-2DC:725853054 : accessed 10 Apr 2013). Luxembourg Church Record, Bertrange > Baptêmes 1781-1797, confirmations 1791, mariages 1781-1797, sépultures 1781-1797 > image 64 of 254. 1787 Baptismal Record No. 215. (https://familysearch.org/pal:/MM9.3.1/TH-1971-32462-8679-85?cc=2037955 : accessed 6 October 2015). Luxembourg Civil Records, Bertrange > Mariages 1828-1890 Décès 1796-1890 > image 1084 of 1416. 1856 Death Record No. 10. (https://familysearch.org/pal:/MM9.3.1/TH-267-12131-55634-51?cc=1709358&wc=M9M6-2DC:725853054 : accessed 10 Apr 2013). Ibid., Bertrange > Mariages 1828-1890 Décès 1796-1890 > image 988 of 1416. 1847 Death Record No. 15. (https://familysearch.org/pal:/MM9.3.1/TH-267-12131-51852-95?cc=1709358 : accessed 8 October 2015). 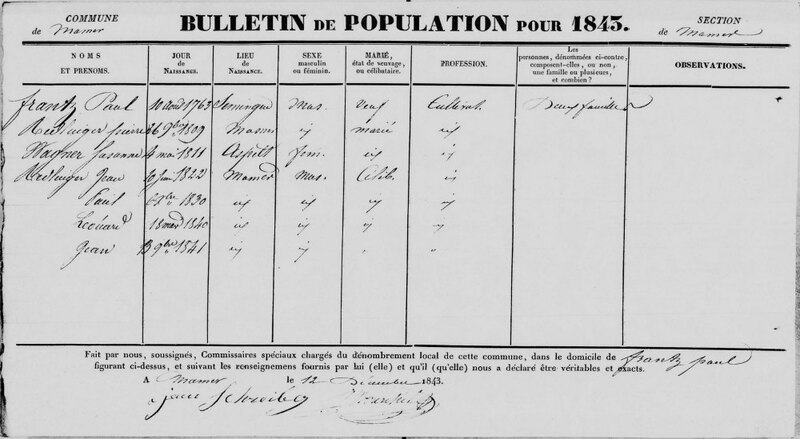 Luxembourg Census Records, Bertrange > 1847 > image 386 of 448. Schmit-Scholer household. (https://familysearch.org/ark:/61903/3:1:3QS7-997B-CYTF?cc=2037957&wc=M5LR-MJG%3A346116301%2C345864101 : accessed 16 September 2017). Luxembourg Civil Records, Bertrange > Mariages 1828-1890 Décès 1796-1890 > image 1215 of 1416. 1870 Death Record No. 17. (https://familysearch.org/pal:/MM9.3.1/TH-267-12131-58375-57?cc=1709358&wc=M9M6-2DC:725853054 : accessed 11 Apr 2013). Ibid., Schuttrange > Naissances 1826-1890 Mariages 1797-1890 Décès 1797-1843 > image 996 of 1488. 1858 Marriage Record No. 2. (https://familysearch.org/ark:/61903/3:1:S3HT-6F8K-J9?cc=1709358&wc=9RY3-T38%3A130363201%2C130466501 : accessed 14 September 2017). Ibid., Schuttrange > Naissances 1826-1890 Mariages 1797-1890 Décès 1797-1843 > image 22 of 1488. 1827 Birth Record No. 12. (https://familysearch.org/ark:/61903/3:1:S3HT-6F8K-RN?cc=1709358&wc=9RY3-T38%3A130363201%2C130466501 : accessed 29 September 2017). Ibid., Bertrange > Naissances, mariages, décès 1891-1894 > image 82 of 99. 1892 Death Record No. 21. (https://familysearch.org/ark:/61903/3:1:S3HT-DRHS-CY5?cc=1709358&wc=9RYM-L2V%3A129622901%2C129717601 : accessed 19 September 2017). Ibid., Bertrange > Mariages 1895-1923 Décès 1895-1912 > image 252 of 370. 1898 Death Record No. 11. (https://familysearch.org/ark:/61903/3:1:3QS7-L97J-JZWQ?cc=1709358&wc=9RTY-J4C%3A129622901%2C129807601 : accessed 15 September 2017). Ibid., Bettendorf > Mariages 1817-1890 Décès 1800-1859 > image 444 of 1494. 1852 Marriage Record No. 1. (https://familysearch.org/ark:/61903/3:1:S3HY-6RW9-8PB?cc=1709358&wc=9RY8-SP8%3A129626601%2C129729901 : accessed 14 September 2017). Ibid., Bettendorf > Naissances 1800-1827 > image 177 of 306. 1819 Birth Record (left, top). (https://familysearch.org/ark:/61903/3:1:S3HY-DRLL-2Y?cc=1709358&wc=9RYW-DPD%3A129626601%2C129760501 : accessed 19 September 2019). Ibid., Bettendorf > Décès 1860-1890 > image 305 of 465. 1879 Death Record No. 26. (https://familysearch.org/ark:/61903/3:1:S3HY-6M8S-HJV?cc=1709358&wc=9RYH-82S%3A129626601%2C129626602 : accessed 14 September 2017). Ibid., Bettendorf > Décès 1895-1923 > image 2 of 389. 1895 Death Record No. 3. 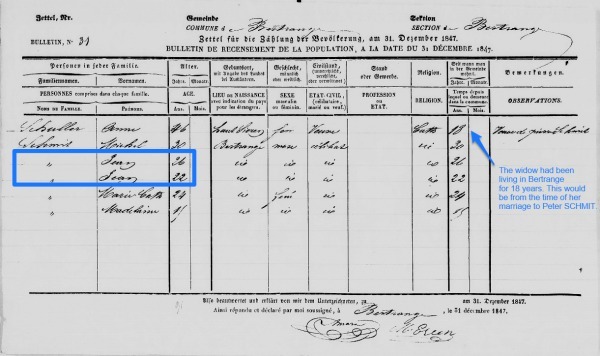 (https://familysearch.org/ark:/61903/3:1:3QS7-L97V-HR8J?cc=1709358&wc=9RT1-926%3A129626601%2C129623802 : accessed 14 September 2017). Ibid., Waldbillig > Naissances 1871-1890 Mariages 1796-1798, 1800-1803, 1805-1890 Décès 1796-1803, 1805-1838 > image 863 of 1486. 1852 Marriage Record No. 5. (https://familysearch.org/ark:/61903/3:1:S3HY-DR53-L8K?cc=1709358&wc=9RYW-N38%3A130535001%2C130636701 : accessed 14 September 2017). Ibid., Bettborn > Décès 1895-1923 > image 34 of 217. 1898 Death Record No. 20. (https://familysearch.org/ark:/61903/3:1:3QS7-897V-9X2K?cc=1709358&wc=9RTB-C6L%3A129627501%2C129623802 : accessed 14 September 2017). Ibid., Bettborn > Décès 1813-1891 > image 691 of 695. 1890 Death Record No. 20. (https://familysearch.org/ark:/61903/3:1:S3HY-DRL2-1J?cc=1709358&wc=9RYW-DP6%3A129627501%2C129627502 : accessed 14 September 2017). Ibid., Bertrange > Naissances 1796-1890 Mariages 1796-1827 > image 224 of 1480. 1820 Birth Record No. 16. (https://familysearch.org/ark:/61903/3:1:S3HY-X36Q-948?cc=1709358&wc=9RY8-YWL%3A129622901%2C129854201 : accessed 29 September 2017).